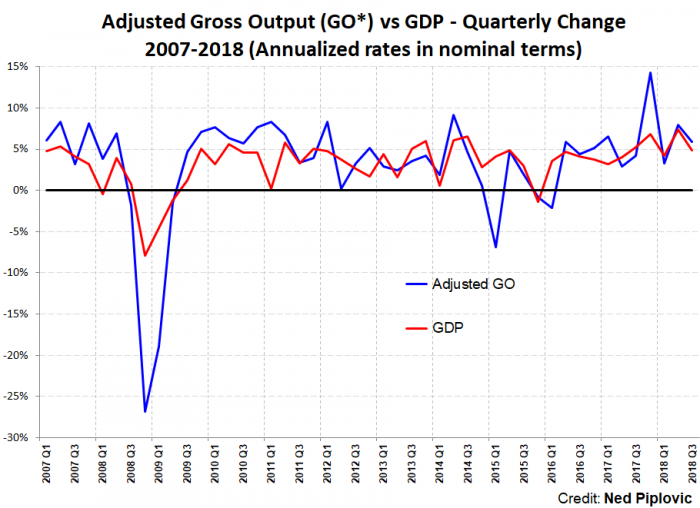 Washington, DC (Friday, April 19, 2019): Today the federal government released gross output (GO) for the 4th quarter 2018, and the increase (2.3% in real terms) confirmed a slow-growth economy as we enter a new year. For the entire year of 2018, real GO grew at 2.91%, slightly faster than 2.86% for real GDP. That’s an improvement over 2016 (only 1.6% increase in real GDP) and 2017 (2.3% increase in real GDP), but not the 3-4% the Trump supply-side economists had hoped for. No doubt the corporate tax cuts had a positive effect, but the largest factor inhibiting growth is probably the Trump trade war. Trade plays a much bigger role in the US and world economy; representing over 25% of spending in the US economy. And at the end of last year, world trade slumped, and Chinese exports plummeted. Last month, the federal government reported that real GDP growth, the “bottom line” of national income accounting, slowed for the second consecutive quarter. After dropping from 4.2% in the second quarter to 3.4% in the third quarter, real GDP only grew 2.2% in the fourth quarter. Today the federal government (Bureau of Economic Analysis in the US Commerce Department) released 4th quarter estimates of gross output (GO), the “top line” in national income accounting. 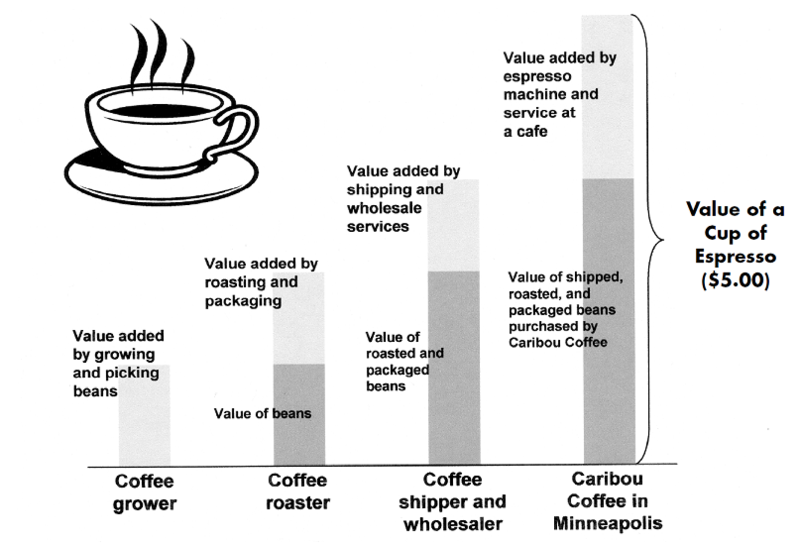 It measures spending at all stages of production, including the supply chain. The results were tepid in comparison to the previous four periods. Total spending on new goods and services (adjusted GO)  was slightly more than $45.2 trillion in nominal terms. Real GO advanced at an annualized rate of 2.3% in the 4th quarter – only slightly above the 2.2% real GDP growth. Business-to-business (B2B) spending rose only slightly (0.3%) above third quarter and substantially slower than the 2.2% growth rate of consumer spending in the same period. Note: Contrary to what the media says, consumer spending does not drive the economy, and does not represent two-thirds of the economy. 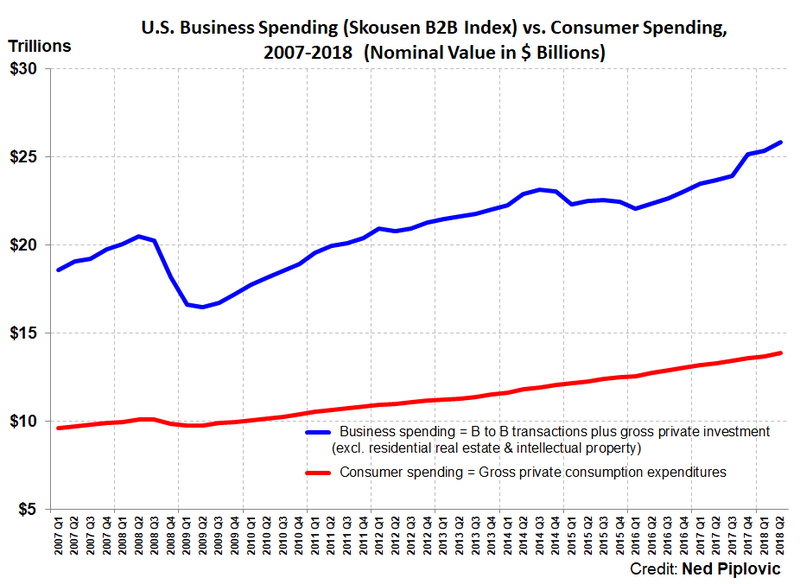 Using GO as a better, more accurate measure of total spending in the economy, the business sector (B2B spending) is almost twice the size as consumer spending. Consumer spending is the effect, not the cause, of prosperity (Say’s law). While the reduced growth of business spending in the fourth quarter suggests economic slowdown, that slowdown was affected by multiple factors. Fears of U.S.-China trade war escalation, as well as uncertainty about the actions of the Federal Reserve regarding interest rates, drove down the overall markets in late 2018. These fears and uncertainties undoubtedly influenced the reduction in fourth quarter business spending as well. However, the December announcement that the Fed is not planning additional rate hikes in 2019 and only one hikes in 2020, as well as positive developments in trade negotiations with China, have lessened some of the concerns and the markets have been recovering since the beginning of the year. While lower than last period, Gross Output growth was broad based across industries. All sectors of the economy – except Mining, and Arts, entertainment, recreation, accommodation, and food services – advanced in the fourth quarter. Government spending rose 3.5% in nominal terms, which was the lowest growth rate in the past six quarters. Whenever GO is growing faster than GDP, as it has been doing in most of 2018, it’s a positive sign that the economy is still robust and growing. However, it is clearly growing at a slower pace as we enter 2019. And GO* is clearly growing far less than GDP in the 4th quarter 2018. The advance estimate of first-quarter GDP will be released next week, April 26, and is expected to be 2% or less. After growing at double-digit percentages and nearly doubling over the previous four quarters, the mining sector pulled back 7.2% in the fourth quarter on an annualized basis. However, the sector comprises less than 2% of the entire Gross Output and the fourth quarter decline has only a small impact. Similarly, the Arts, entertainment, recreation, accommodation, and food services– the other declining segment – contributed only 4% to the total GO. Therefore, this segment’s 1.6% annualized decline also had minimal impact on the growth of the overall GO. However, as the second largest segment that accounts for more than 17% of GO, the 1% growth of the manufacturing sector had a much bigger impact on the modest GO growth in the fourth quarter. More importantly, while nondurable goods declined 1.9%, the durable goods subsegment – which is a much better indicators of long-term economic expansion – advanced 3.9%. The finance, insurance, real estate, rental and leasing sector is the largest GO sector with a 19% share of GO. This sector advanced at the same 4.8% rate as it did in the previous period and 26% faster than the 3.8% growth rate from two periods ago. The fastest growing sectors were utilities, transportation and warehousing. Utilities, which account for just 1.4% of GO, advanced at 12.9% which advanced at 11%. Transportation and warehousing grew at 11%. While growing at a slightly lower rate than utilities, transportation and warehousing – with a 3.4% share — had a bigger positive impact on the growth of the overall GO. Total government spending accounts for 10.6% of the total GO spending and increased 3.5% in the fourth quarter. However, this growth rate was the lowest since the second quarter of 2017. While federal government increased 3.3%, state and local government expanded a slightly higher rate of 3.5%. Gross domestic product (GDP) attempts to measure the “use” economy, i.e., the value of finished goods and services ready for use by consumers, business and government. GDP is similar to the “bottom line” (gross profits) of an accounting statement, which determined the “value added” or the value of final use. GO tends to be more sensitive to the business cycle, and more volatile, than GDP. During the financial crisis of 2008-09, GO fell much faster than GDP, and afterwards, recovered more quickly than GDP. Still, it wasn’t until late 2013 that GO fully recovered from its peak in 2007. Recently quarterly GO has been outpacing GDP, suggesting a growing economy. Our business-to-business (B2B) index is also useful. It measures all the business spending in the supply chain and new private capital investment. Nominal B2B activity increased 1.7% in the third quarter to $26.37 trillion. Meanwhile, consumer spending rose to $14.2 trillion, which is equivalent to a 3.9% annualized growth rate. In real terms, B2B activity rose at an annualized rate of 0.3% and consumer spending rose at a significantly slower rate of 2.2%. The BEA’s decision in 2014 to publish GO on a quarterly basis in its “GDP by Industry” data is a major achievement in national income accounting. GO is the first new output statistic published on a quarterly basis since GDP was invented in the 1940s. The BEA currently uses a limited measure of total sales of goods and services in the production process. Once products are fabricated and packaged at the manufacturing stage, the BEA’s GO only adds “net” sales at the wholesale and retail level. Its official GO for the 2018 4th quarter is slightly above $37.15 trillion. By including gross sales at the wholesale and retail level, the adjusted GO increases to more than $45.2 trillion in Q4 2018. Thus, the BEA omits more than $8 trillion in business-to-business (B2B) transactions in its GO statistics. We include them as a legitimate economic activity that should be accounted for in GO, which we call Adjusted GO. See the new introduction to Mark Skousen, The Structure of Production, 3rd ed. (New York University Press, 2015), pp. xv-xvi. Is the US economic boom coming to an end? Last month the federal government reported that real GDP growth, the “bottom line” of national income accounting, slowed from 4.2% in the second quarter to 3.4% in the third quarter. Many pundits said that the slowdown will continue and that a recession is inevitable by 2020. But today’s economic numbers suggest otherwise. Business spending, in particular, is rising at a faster pace. Today the federal government (Bureau of Economic Analysis in the US Commerce Department) released 3rd quarter estimates of gross output (GO), the “top line” in national income accounting. It measures spending at all stages of production. The results were eye-popping. Total spending on new goods and services (adj. GO) topped $45 trillion for the first time. Real GO climbed at an annualized rate of 4.6% in the 3rd quarter, much faster than GDP. 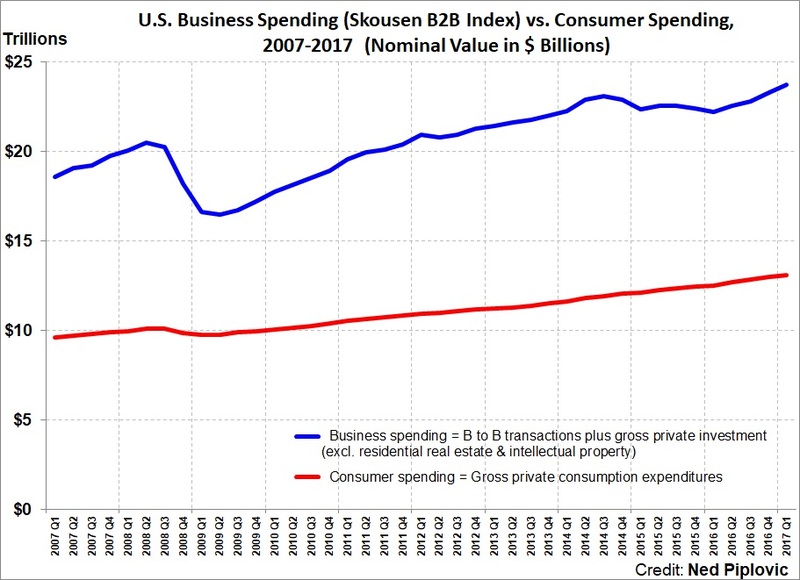 Business-to-business (B2B) spending rose even faster, 5.8% in real terms, much more than consumer spending (up 3.2%). Note: Contrary to what the media says, consumer spending does not drive the economy, and does not represent two-thirds of the economy. 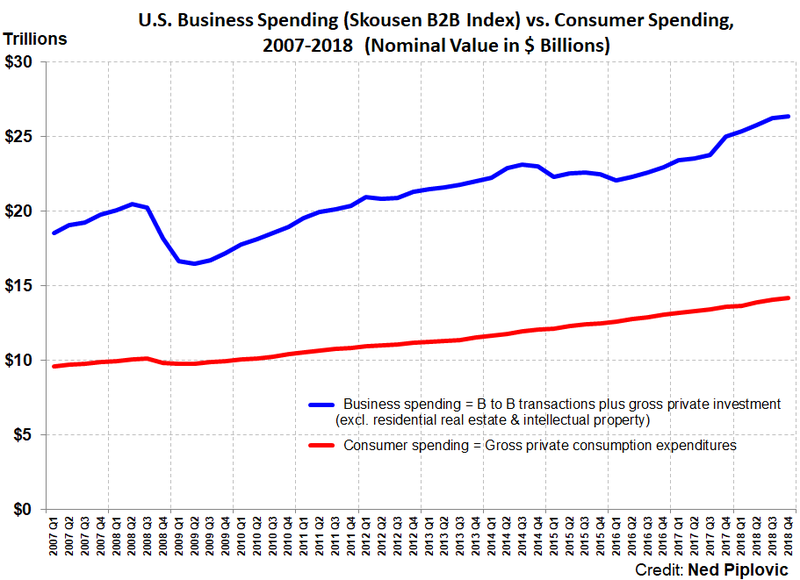 Using GO as a better, more accurate measure of total spending in the economy, business spending (B2B) is almost twice the size as consumer spending. Consumer spending is the effect, not the cause, of prosperity (Say’s law). There is no slowdown at all in the supply chain and business spending – in fact, they are growing faster. Whenever GO is growing faster than GDP, as it has been doing in 2018, it’s a positive sign that the economy is still robust and growing. That’s what we are seeing. Fourth quarter GDP will be released next week, February 28. I expect real GDP to growth faster than 3.4%. The mining sector slowed its growth compared to the previous quarter but was still the fastest growing sector in the third quarter with an annualized growth rate of 22.8%. While business growth in this sector provides a solid foundation for various industries later in the supply chain, the mining castor makes up just 1.8% of the total GO and has a lesser impact on the GO growth compared to some of the larger sectors. Because the manufacturing sector comprises more than 17% of the total GO, the 9.1% growth rate of this sector has a much greater impact on the growth of the overall GO. Furthermore, within this sector, Durable goods production advanced at nearly 13%, which more than twice the 5.3% growth rate for Nondurable goods. The Finance, insurance, real estate, rental and leasing sector is the largest GO sector with a 19% share, this sector advanced at 4.8%, which was more than 26% better than the 3.8% growth rate from the previous period. Additionally, the Construction sector advanced 7%, Arts, entertainment, recreation, accommodation, and food services sector grew 6.4% and Educational services, health care, and social assistance sector expanded 8.1%. Another indication that businesses and individuals are spending with a long-term horizon outlook is that Wholesale trade spending growth of 5.2% is substantially higher than the 3.2% expansion of Retail spending. The only two sectors that retracted in the third quarter were Agriculture, forestry, fishing, and hunting, which declined 8.2%, and Utilities with a 6.5% contraction. Total government spending – 10.6% of the total GO – increase of 4.4% is 10% larger than the 4% growth from the previous quarter. However, the growth was distributed more evenly between the federal government (+4.2%) and State and local government growth (4.5%). While state government expanded just slightly faster than the 4.3% in previous period, the federal government’s spending grew at a pace that its more than 31% faster than its growth the second quarter of 2018. Our business-to-business (B2B) index is also useful. It measures all the business spending in the supply chain and new private capital investment. Nominal B2B activity increased 8.1% in the third quarter to $26.37 trillion. Meanwhile, consumer spending rose to $14 trillion, which is equivalent to a 5% annualized growth rate. In real terms, B2B activity rose at an annualized rate of 5.8% and consumer spending rose at a significantly slower rate of 3.2%. The BEA currently uses a limited measure of total sales of goods and services in the production process. Once products are fabricated and packaged at the manufacturing stage, the BEA’s GO only adds “net” sales at the wholesale and retail level. Its official GO for the 2018 3rd quarter is slightly above $36.8 trillion. By including gross sales at the wholesale and retail level, the adjusted GO increases to more than $45 trillion in Q3 2018. Thus, the BEA omits more than $8.2 trillion in business-to-business (B2B) transactions in its GO statistics. We include them as a legitimate economic activity that should be accounted for in GO, which we call Adjusted GO. See the new introduction to Mark Skousen, The Structure of Production, 3rd ed. (New York University Press, 2015), pp. xv-xvi. Washington, DC (Thursday, November 1, 2018): Gross output (GO), the top line of national accounting that measures spending at all stages of production, continued to build on the growth from the first quarter and advanced at an even faster pace than GDP in the second quarter. Based on data released on Thursday, November 1, 2018 by the BEA, adjusted GO (GO*) increased in real terms at an annualized rate of 4.6% in the second quarter of 2018. This increase is over 50% higher than the last period’s 2.7% growth rate and substantially higher than the real GDP’s 4.1% growth rate in the second quarter of 2018. 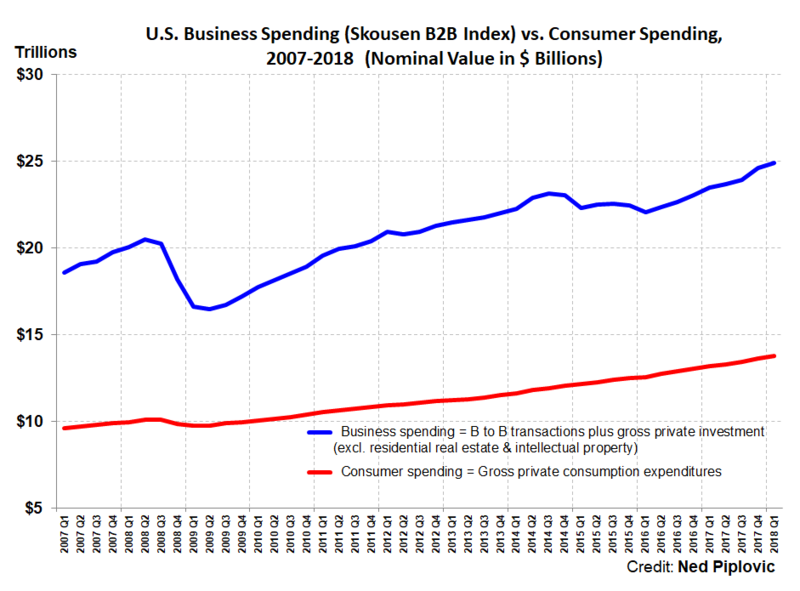 The second quarter Skousen B2B Index, a measure of business spending throughout the supply chain, increased at 7.8% in nominal terms, which is significantly higher than the 4.5% growth rate from the previous quarter. After a slowdown in the previous quarter, the growth in the second quarter is the highest strongest growth rate since the first quarter of 2017. In the second quarter of 2018, B2B transactions rose at an annual rate of 4.4% in real terms, which is three times higher than the growth rate from the previous quarter, and faster than GDP. Furthermore, B2B spending increase was 36% higher than the growth of consumer spending in the second quarter. The nominal adj. GO increased at an outstanding 7.9% in the second quarter of 2018 to reach $44.4 trillion. This current adjusted GO is more than double the size of the current $20.4 trillion GDP figure, which measures final output only. After a lackluster growth in the first quarter, the broader GO* growth rate of 4.6% in real terms indicates a heating up in economic activity expansion again, most likely because of the HUGE wholesale and retail trade increase in the fourth quarter dampened the first quarter results and second quarter performance moved closer to normal levels. “I view the slower growth in GO in the 1st quarter as temporary and the economy is likely to recover in the 2nd quarter,” commented Skousen about the results in the previous quarter. The current quarter’s results indicate that Skousen’s assessment was accurate. While growth in some industrial sectors was minor, every single sector advanced versus the previous quarter, which drove the growth of GO in the second quarter of 2018. While spending increased at mild rates the previous quarter, the current quarter’s numbers indicate a continuation of robust growth across the economy, and especially in the early stages of production, such as mining and construction. Growth in the early stages is usually a reliable leading economic indicator that overall economic growth should continue to expand. After a brief slowdown in the previous period, the mining sector’s growth advanced at the highest rate of any sector – 38%. While the growth of the mining sector is quite robust and a leading indicator, it has a relatively small impact on the growth of the overall GO due to the mining sector’s low share of just 1.7% of total GO. Conversely, the manufacturing sector, which accounts for 17% of the total GO, advanced 7.2%, which was close to last period’s 7.6% growth rate. At 9.2%, the growth rate for Nondurable Goods was significantly higher than the 5.2% growth rate for Durable Goods. The largest sector – Finance, insurance, real estate, rental and leasing – advanced at 3.8%, which was substantially lower than previous period’s growth rate of nearly 10%. Additionally, two more segments posted double-digit percentage growth rates for the second quarter. While the Wholesale trade sector increased 10.8%, the Arts, entertainment, recreation, accommodation, and food services sector advanced 12.7%. The growth in this sector was most likely driven by the low unemployment, wage growth and overall economic growth, which provided consumer with additional funds for discretionary spending. These two segments account for a 9% combined share of total GO. Total government spending (11% share of total GO) increased at 4%, which was higher than the 3.8% from the previous period but still considerably lower than the 6.7% average growth rate over the past two years. Additionally, this two-year average growth rate of total government spending declined for the second consecutive period after rising for five consecutive quarters. State and local government spending increased at 4.3% which was higher than the 3.2% growth of government spending at the federal level. Our business-to-business (B2B) index is also useful. It measures all the business spending in the supply chain and new private capital investment. Nominal B2B activity increased 7.8% in the second quarter to $25.85 trillion. Meanwhile, consumer spending rose to $13.8 trillion, which is equivalent to a 5.7% annualized growth rate. In real terms, B2B activity rose at an annualized rate of 4.4% and consumer spending rose at a significantly slower rate of 2.7%. The BEA currently uses a limited measure of total sales of goods and services in the production process. Once products are fabricated and packaged at the manufacturing stage, the BEA’s GO only adds “net” sales at the wholesale and retail level. Its official GO for the 2018 2nd quarter is slightly above $36.2 trillion. By including gross sales at the wholesale and retail level, the adjusted GO increases to more than $44.4 trillion in Q2 2018. Thus, the BEA omits more than $8 trillion in business-to-business (B2B) transactions in its GO statistics. We include them as a legitimate economic activity that should be accounted for in GO, which we call Adjusted GO. See the new introduction to Mark Skousen, The Structure of Production, 3rd ed. (New York University Press, 2015), pp. xv-xvi. 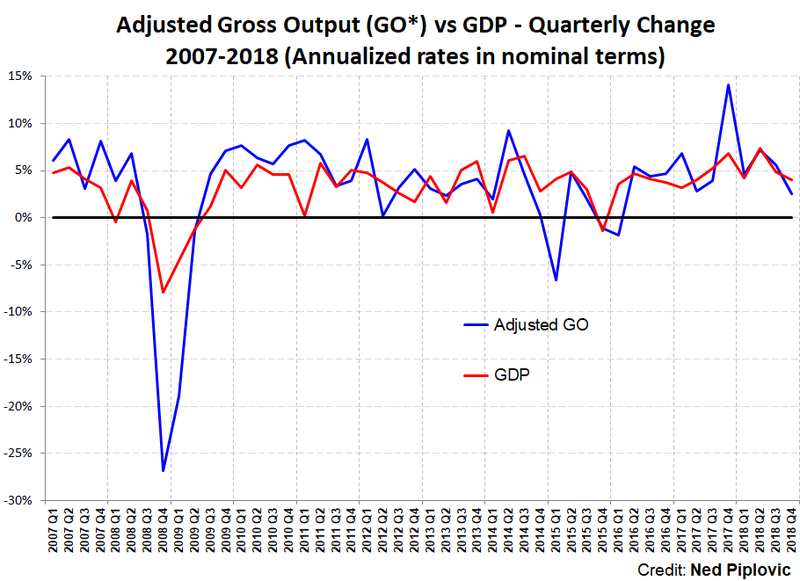 Washington, DC (Friday, July 20, 2018): Gross output (GO), the top line of national accounting that measures spending at all stages of production, continued to expand in the first quarter, but at a slower pace than the previous quarter. Based on data released on Friday, July 20, 2018 by the BEA, real GO increased at an annualized rate of 2.7% in the first quarter of 2018. This increase lags behind the last period’s 4.3% growth rate, but faster than real GDP, which increased only 2.0% in the first quarter of 2018. Real GDP, the bottom line of national income accounting, rose at an annualized rate of 2.0% in the first quarter of 2018. The 2.7% real GO growth rate in Q1 2018 is a good indication that, while growing slower than in the Q4 2017, intermediate business activity is still expanding and should translate into continued GDP growth in the near future. According to a recent study by David Ranson, chief economist at HCWE & Co., GO anticipates changes in GDP by as much as 12 weeks in advance and thus serves as a reliable leading indicator: http://www.hcwe.com/guest/EW-0118.pdf. 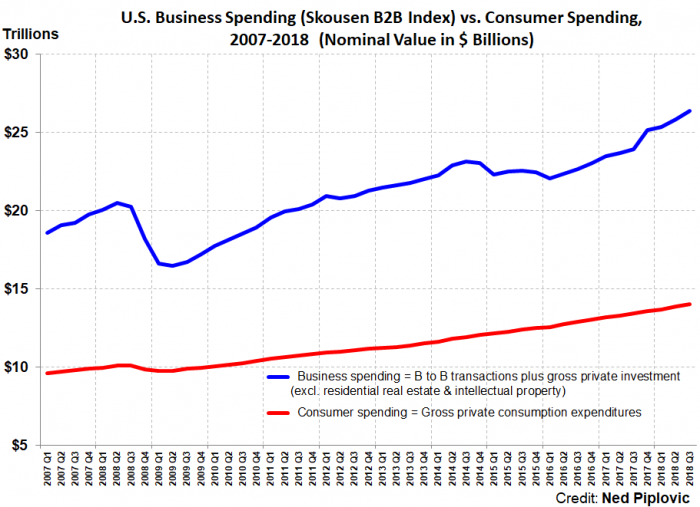 The first quarter Skousen B2B Index, a measure of business spending throughout the supply chain, increased at 4.5% in nominal terms, which is significantly lower than the 12.2% growth rate from the previous quarter. After a spike in the previous quarter, the growth in the first quarter puts the business spending increase at almost the same level it was in the third quarter 2017. In the first quarter of 2018, B2B transactions rose at an annual rate of 1.36% in real terms, which is just a fraction of the 8.5% rate from the previous quarter. All but two industrial sectors increased versus the previous quarter, which drove the growth of GO in the first quarter of 2018. While spending increased at extraordinary rates in the previous quarter, the current quarter’s numbers still indicated a robust growth in the early stages of production, such as mining, manufacturing and construction, which is usually a reliable leading economic indicator that overall economic growth should continue to expand. The mining sector’s growth slowed from 46% in the previous quarter to the current 12.2% rate. While lower than the Q4 2017 rate, the current growth rate is still significantly higher than the 4.7% increase in Q3 2017. However, the growth of the mining sector is still robust, it has a relatively small impact on the growth of the overall GO due to the mining sector’s low share of just 1.5% of total GO. Conversely, the manufacturing sector’s 7.6% spending increase has a much bigger impact since the manufacturing sector accounts for nearly a fifth of total GO (18.2% share). Therefore, the 7.6% current growth of the manufacturing sector, while lower than last period’s 13%, has a much greater positive impact on the total GO and should be an even better indicator of a continued economic expansion. The 5.8% growth rate for durable goods was lower than the growth rate for non-durable goods, which rose 9.5% in the first quarter. Another sector with an 18% share of GO is the Finance, insurance, real estate, rental and leasing sector. This is one of the few sectors that expanded at a greater rate than in the previous quarter. After increasing its growth rate from 2.8% in Q3 2017 to 6% in the in Q4 2017, this sector expanded at nearly 10% in the first quarter of 2018. Within the overall sector, the Finance and insurance sub-segment rose at 16.4%, which is the highest rate increase of any sector or segment for the current period. Additionally, after rising 6.4% in the previous quarter, the real estate, rental and leasing sub-segment expanded at a slightly lower, but still respectable 5.4%. Additionally, two more segments posted growth rates in excess of 9% for the first quarter. While the Construction sector increased 9.9%, the transportation and warehousing sector rose 9.1%. These two segments account for a combined GO share of 7.7%. Only two segments reduced spending from the previous quarter. The Arts, entertainment, recreation, accommodation, and food services sector accounts for just 4% of the total GO and declined almost 3% which is the same decline as in the previous quarter. Additionally, the spending classified as “Other services, except government”, which accounts for 2.2% of GO, declined 2% versus Q4 2017. Total government spending (11% share of total GO) increased at 3.8%. This rate was significantly lower than the 6.75% two-year average. The two-year average growth rate of total government spending declined for the first time after rising for five consecutive quarters. State and local government spending and Federal government spending rose at nearly identical rates of 3.8% and 3.7%, respectively. Our business-to-business (B2B) index is also useful. It measures all the business spending in the supply chain and new private capital investment. Nominal B2B activity increased 4.5% in the first quarter to $24.9 trillion. Meanwhile, consumer spending rose to $13.8 trillion, which is equivalent to a 3.4% annualized growth rate. In real terms, B2B activity rose at an annualized rate of 1.4% and consumer spending rose 1.2%. The BEA currently uses a limited measure of total sales of goods and services in the production process. Once products are fabricated and packaged at the manufacturing stage, the BEA’s GO only adds “net” sales at the wholesale and retail level. Its official GO for the 2018 1st quarter is slightly below $35 trillion. By including gross sales at the wholesale and retail level, the adjusted GO increases to $43.1 trillion in Q1 2018. Thus, the BEA omits more than $8 trillion in business-to-business (B2B) transactions in its GO statistics. We include them as a legitimate economic activity that should be accounted for in GO, which we call Adjusted GO. See the new introduction to Mark Skousen, The Structure of Production, 3rd ed. (New York University Press, 2015), pp. xv-xvi. 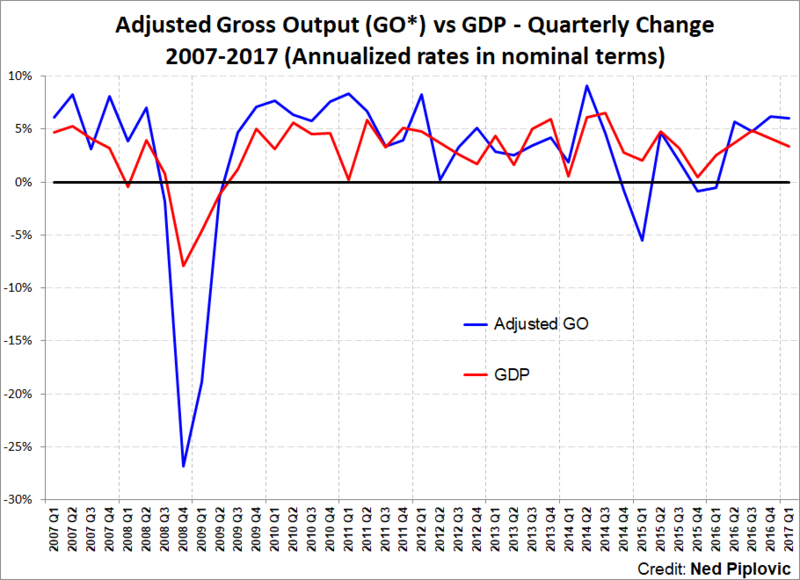 For the previous two quarters (Q2 and Q3, 2017) Gross Output, the new broader measure of the economy that includes the supply chain, was growing at a slower rate than GDP. According to my research, that suggested a slowdown in GDP. Today the Bureau of Economic Analysis released the advance estimate for Q4 2014 GDP. After two consecutive quarters (Q2 & Q3) of 3%-plus growth in real terms, the GDP grew only 2.6% in Q4 — just as GO predicted. 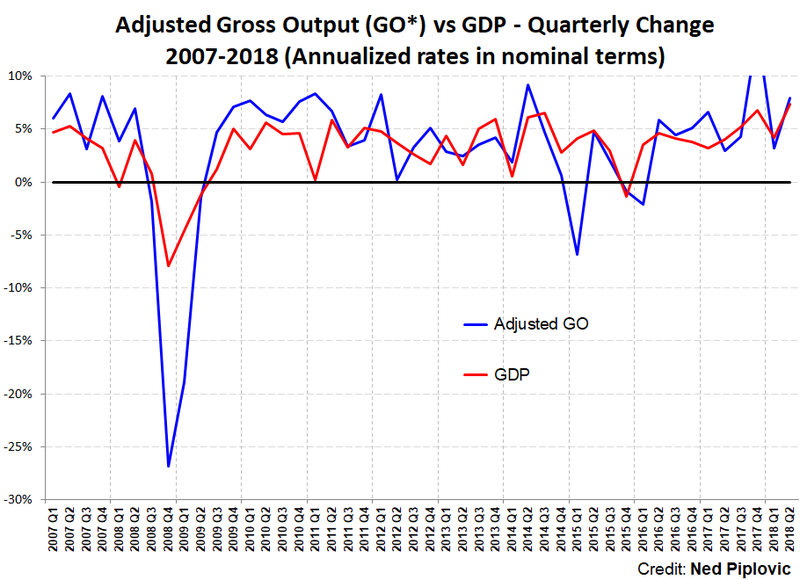 For some time now, I’ve been arguing that gross output (GO), the top line in national income accounting, is a more accurate measure of total economic activity. Because it includes business-to-business (B2B) transactions in the earlier stages of production, GO can anticipate changes in GDP (the bottom line) as much as 12 weeks in advance. Since the first quarter of 2017, GO has been growing at slower rate than GDP. 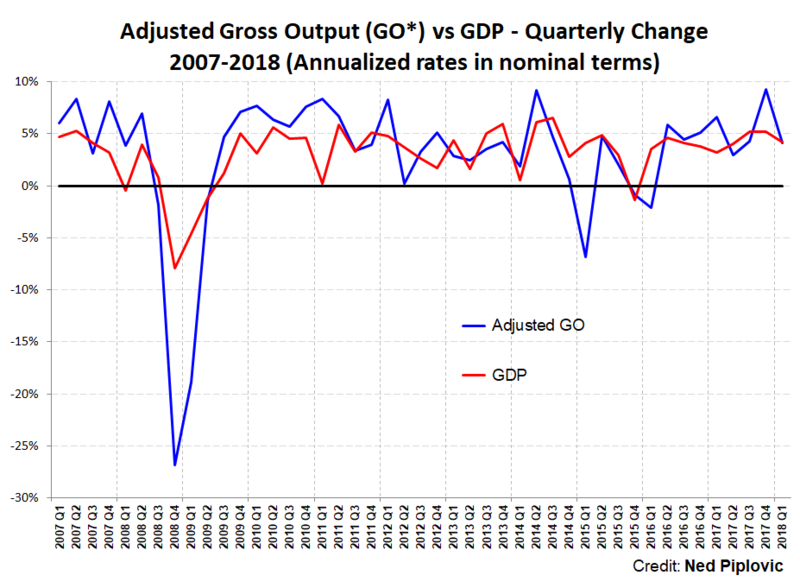 In Q2, real GO rose at a tepid 1.7%, substantially less than 3.1% for GDP, and in Q3 2017, real GO accelerated at 2.7% growth rate, but still less than the 3.1% real GDP growth for the 3rd quarter. I concluded in November, “Second quarter GO suggests potential slowdown in the economy, despite the currently rising GDP.” Please reference the 2017 Q2 and 2017 Q3 press releases for more information. 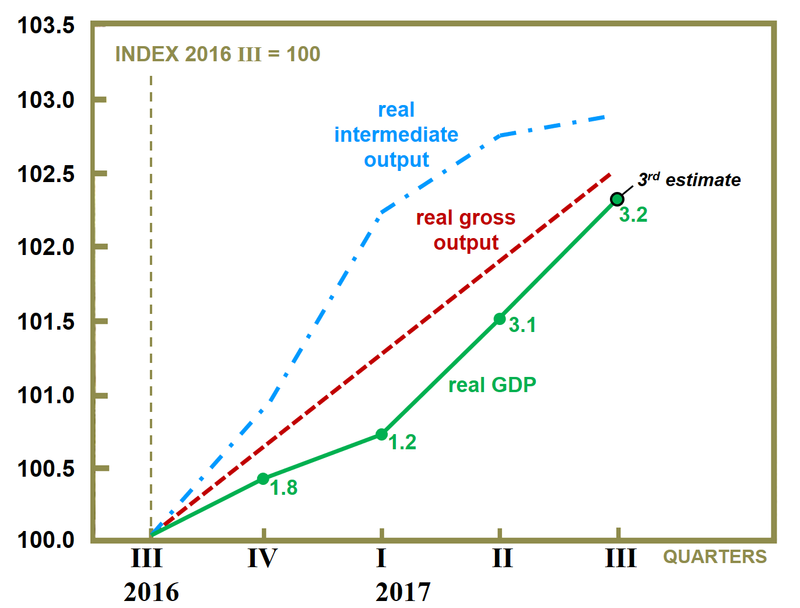 The following chart provided by David Ranson, chief economist at HCWE & Co., shows the relationship between GO, II and GDP since the third quarter of 2016. Data: Quarterly seasonally-adjusted chain-type quantity indices of intermediate inputs, gross output and gross domestic product (Bureau of Economic Analysis). They said it couldn’t be done. Austrian economics is so different, they said, that it couldn’t be integrated into standard “neo-classical” textbooks. Consequently, college students learn little or nothing about the great Austrian economists (Mises, Hayek, Schumpeter). Professor Mark Skousen’s Economic Logic (now in its new 5th edition) aims to change that. Based on his popular course taught at Chapman University, Columbia Business School, and other institutions, Skousen starts his “micro” section with Carl Menger’s “theory of the good” and the profit-and-loss income statement to explain the dynamics of the market process, entrepreneurship, and the advantages of saving. Business students find this approach especially valuable. After analyzing the dynamics of the P&L statement, supply and demand diagrams are introduced. Figure 1. Four Stages of Production of Espresso Coffee. Notice that this Hayekian 4-stage model ties into national income accounting. GDP represents the final stage of production – the value of all finished goods and services produced in a year. Every quarter a public-traded company releases a financial statement that includes both the “top line” (revenues/sales) and a “bottom line” (earnings, net income). GO is a measure of Hayek’s triangle. It adds up sales or revenues at all stages of production throughout the year, while GDP counts only final sales. GO is a vital statistic, as it includes the value of the supply chain, all the business-to-business (B2B) transactions that move the production process toward final use. It is a measure of the “make” economy, while GDP estimates the value of the “use” economy. In Economic Logic, GO is incorporated as a more comprehensive measure of the economy, serves as a valuable tool in analyzing the business cycle, restores the business sector as the major driver of the economy, and deserves to be updated on a quarterly basis along with GDP. 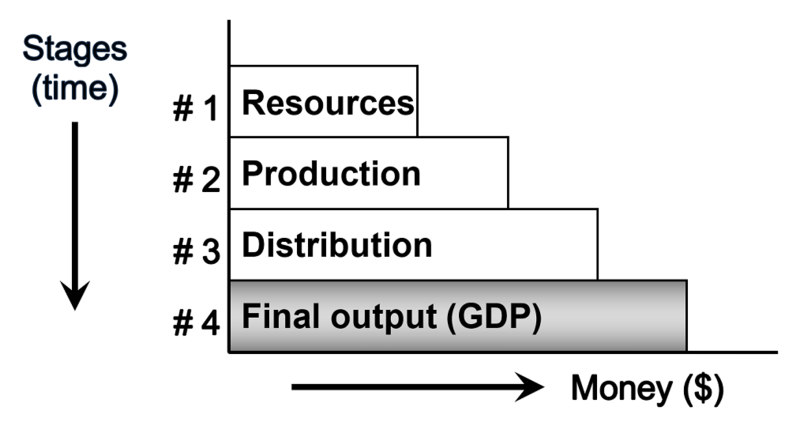 John Mackey’s “stakeholder” model of capitalism has been incorporated into the stages-of-production process in chapter 3. Moving the production process along requires the cooperation of all economic inputs or stakeholders. Updated discussions on job creation, the labor force participation rate, and the recovery after the Great Recession is discussed in detail in chapters 10 and 25. Chapter 10 also addresses the unemployment issues in Europe and America, and the prospects for renewed growth under a Trump administration. Recent government regulations (Sarbanes-Oxley, Dodd-Frank, SEC) following the 2008 financial crisis and the Bernie Madoff fraud are discussed in chapter 13. The consumption and savings rate patterns of China are compared to those of the United States in chapter 17. This comparison helps to determine what drives the economy, consumer spending or savings/investment? The end of the Federal Reserve’s “easy money” policies of ZIRP (zero interest rate policy) and Quantitative Easing (QE) in 2017 are debated in chapter 19. The on-going debate on “austerity” vs. “stimulus” has been added to chapter 22. What factor is more significant in the business cycle, Keynesian lack of “aggregate demand” or Hayekian “malinvestment”? See chapter 25. The rise of state capitalism in China is highlighted in chapter 27. The international gold standard, the defects of central banking, and the Mises/Hayek theory of the business cycle. A full critique of the Keynesian Aggregate Supply and Demand (AS-AD) model, and a revolutionary Austrian alternative (chapters 22 and 25). Plus a critique of Marxism and socialist central planning (chapter 27). Entrepreneurship, the financial markets, environmental economics, monetary policy and inflation, federal spending and taxes, and government regulation. Leaders of all schools, including Austrian, Keynesians, Marxist, Chicago, and Public Choice. Austrians highlighted include Ludwig von Mises (chapter 2), Carl Menger (3), Joseph Schumpeter and Israel Kirzner (8) Eugen Böhm-Bawerk (11), Peter F. Drucker (12), Murray Rothbard (18), and Friedrich Hayek (25). Other highlighted free-market economists include Adam Smith, Gary Becker, George Stigler, John Bates Clark, J. B. Say, Milton Friedman, James Buchanan, Art Laffer, Ronald Coase, Julian Simon, and Robert Mundell. 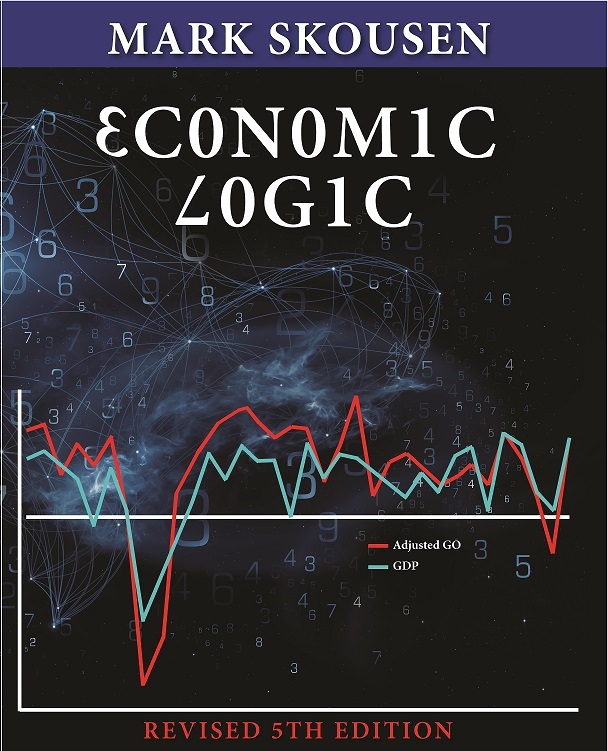 Economic Logic is dedicated to Friedrich Hayek and Milton Friedman, thus drawing from the best of the Austrian and Chicago schools of free-market economics. A glossary of terms has been added to this edition. Mark Skousen, Ph. D., is a Presidential Professor at Chapman University, has taught economics at Columbia University, is the former president of FEE, and is the author of over 25 books, including several in Austrian economics: The Structure of Production (NYU Press); Vienna and Chicago, Friends or Foes? (Capital Press), The Making of Modern Economics (Routledge), and A Viennese Waltz Down Wall Street: Austrian Economics for Investors (LFB Books). For more information, go to www.mskousen.com. Has Keynes Trumped Adam Smith? A nice reprint of one of my articles on a web blog. A great way to spread the word. A discovery of my pamphlet on the principles of freedom. Worth a read! This writer uses my work compiling The Compleated Autobiography by Benjamin Franklin, which revealed a lot of the great Founding Father in his later, significant years, in a fascinating new analysis of China and its trade practices. Take a look! Plus, some nice reader reviews of Investing in One Lesson on Cheap Best Books. An important book to read in today’s investing climate. Well, he did it. Glenn Beck has put my uncle Cleon’s book, The 5,000 Year Leap: 28 Principles that Changed the World (How the US Constitution Inspired America’s Greatness) #1 on Amazon.com. I was on his show a couple of weeks ago, and he told me between commercials, “Cleon Skousen’s book changed my life.” He has written an introduction to a new version of the book, which is expected to come out soon. Glenn just announced his “912 Project”–go to www.the912project.com. I wonder where this will all lead.